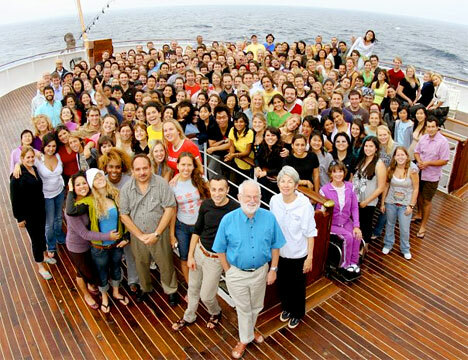 Participants of The Scholar Ship 2007 gather on deck for a group photo. Imagine developing design work and traveling the world at the same time, amongst an international community of thinkers and makers. Over four months, your group will travel by sea to several countries, where you will connect with local communities, gain insights into a wide array of design problems, and better understand the global condition through firsthand experience. As we better learn how to design with the 90% and not just for them, hands-on study trips to developing countries are gaining traction as an important part of design education. Similarly, design NPO initiatives like Project H, One Earth Designs, and Architecture for Humanity grow stronger, and ethnographic research methods continue to play an essential role in design practices that are necessarily global. Now, imagine that we combine all three, supporting them from one platform for experiential learning, design thinking and research. This is my vision for Ocean University (OU), an NPO that brings designers, activists, thinkers and students onboard a dedicated ship to travel the world, develop design work, and provide services to those in need. What sort of participant will you be: A student learning to apply your skills in a real world situation? A senior designer with an established firm, re-energizing your design practice? A design professor conducting research on sabbatical? Or an instructor, leading a special design course on a topic best explored abroad? The itinerary for each port of call—planned with the guidance of local schools, NPO/NGOs, government offices, and supporting partners—will present designers with special opportunities to initiate new design projects or conduct field research. Between ports, the community will work with the insights gained and prepare for their next stop. 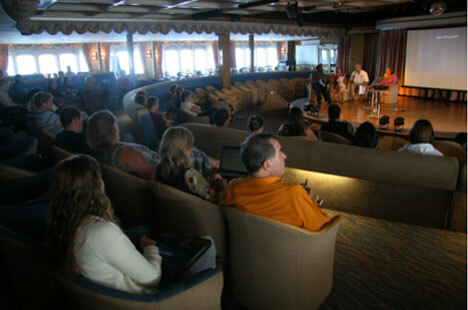 Musical performances on board The Scholar Ship. OU also invites specialists investigating complimentary subjects, such as climate change or global health, to conduct research aboard the ship. Their presence will contribute to the academic community and encourage conversations across disciplines, aiding in the development of multi-faceted, realistic solutions. One day, you might be in the Galapagos watching an ROV explore underwater volcanoes through a remote on-ship camera while another group explores conservation issues alongside members of the island communities. Afterwards, your team will send prototypes to New Zealand for testing, to be retrieved and tested again as we visit different communities across Asia-Pacific a month later. Key to our mission is the adoption of the Designers Accord. Furthermore, all resulting works will be shared with the rest of the world through an Open Innovation approach and Creative Commons licensing. 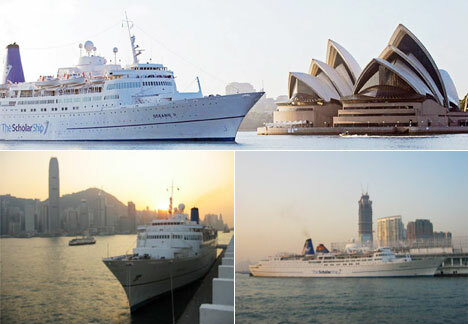 The Scholar Ship docks in Sydney and Hong Kong. Image: The Scholar Ship. Precedent and Legacy: The Scholar Ship Educational voyages by sea are a model found commonly throughout history, from early exploratory expeditions to the grant-funded research trips of the present and, most recently, study abroad programs like Semester at Sea and Peace Boat. In 2007, through an Institute for International Education (IIE) grant, I attended one such program, entitled The Scholar Ship (TSS). 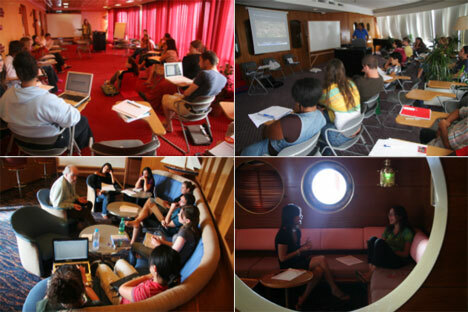 Situated on a Royal Caribbean cruise ship, the program was facilitated by a number of international universities who served as "academic stewards," providing support and accreditation. These included Al Akhawayn University, Morocco; Cardiff University, United Kingdom; Fudan University, China; Macquarie University, Australia; TecnolÃ³gico de Monterrey, Mexico; University of California, Berkeley, USA; and the University of Ghana, Ghana. The route followed by The Scholar Ship on its first voyage. Image: The Scholar Ship. 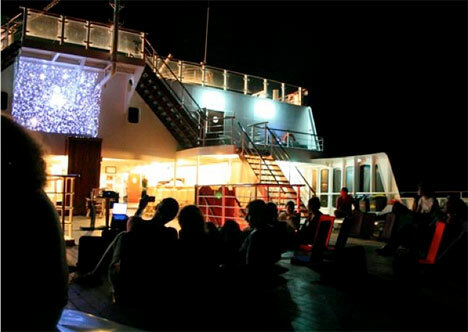 The program brought over 250 people from fifty countries together for its maiden voyage. 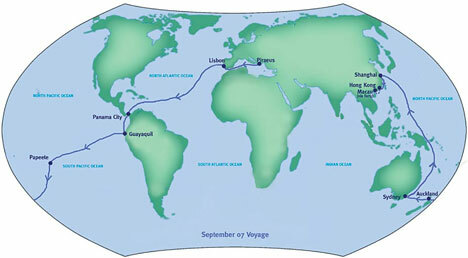 For 16 weeks, we traveled across Greece, Portugal, Panama, Ecuador, French Polynesia, New Zealand, Australia and China. Unfortunately, despite two successful voyages, the program was removed from the offerings of Royal Caribbean Cruises Limited in June of 2008. Though TSS was not a design-centric program, the concept of OU comes directly out of my experience on board, where I realized the vast potential of developing a similar program specifically for design education and public benefit purposes. Though in many ways Ocean University is a continuation of the tradition of TSS, it is also a departure, conceived as a non-profit organization with design at its core. Below, let's take a look at some of OU's key components and themes. International communications students meet with UNICEF staff in Quito, Ecuador, in preparation for a documentary production. The MFA Challenge Many companies traditionally have on-boarding leadership programs targeted at MBA graduates. In these programs, new employees rotate through many branches of a corporation, often living in different countries for months at a time. These types of programs not only help ensure employee retention but also provide trainees with the crucial professional, social and cultural skills they need to succeed. Despite the popular notion that the MFA is the new MBA, similar programs for designers are scarce. Ocean University proposes to change this; through on board internships, designers will work directly with design firms and NPOs on fast-paced projects, cementing the collaborative spirit and cultural broadness necessary for success in today's creative economy. 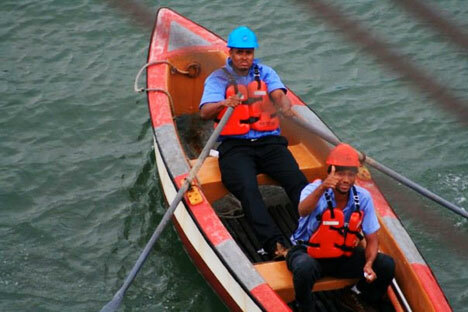 Crew from the Panama port auhority getting ready to bring the ship into the gatun locks of the Panama Canal. Participants and Partnerships Students, design professionals, activists and researchers will be recruited from all over the world to collaborate in a rich environment for experiential learning, backdropped by the mantra "Design with the 90%." Students would take part through a "bring your own teacher" model. If a school chooses to participate based on requests from their faculty or student body, they may propose a course and send an instructor aboard. In addition to helping with accreditation, this also allows the curriculum to flex, adapting easily to new topics each year. Design firms are invited to bring a small team on board to conduct field research and develop design work. They may also offer internships, which would help them identify design talent, much like the MBA on-boarding programs described above. Individual design professionals taking a "gap year," are also welcome—in addition to personal work, they may teach classes and join collaborative projects. Finally, OU opens its doors to all kinds of organizations and corporations, offering them an efficient way to conduct research and directly access a pool of diverse talent. For example, telecommunication companies developing mobile, networked classrooms might use OU as a testing ground. Research institutions are welcome to maintain onboard data centers, piggybacking onto an existing journey and reducing their costs significantly. Media Technologies and Fabrication Resources Media-readiness is key to providing a good working environment and successfully engaging the Open Innovation model. Though challenging, creating a connected environment at sea is possible through the utilization of social networks, on-board satellite links, and, most importantly, careful planning for unavoidable lapses in connection. 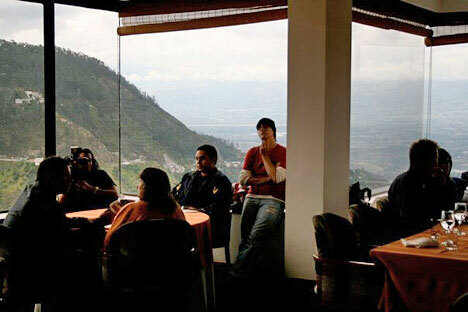 To this end, my experience on TSS confirmed the power of social networking as an effective planning tool for a large, geographically diverse group of people. In March of 2007, seven months prior to embarkation, I gathered most of the participating students together in a Facebook group. 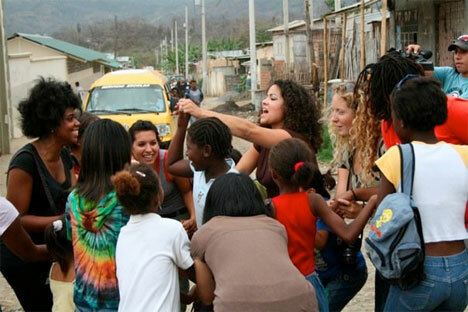 Through it, we began conversations that resulted in the development of numerous student organizations, including a Model United Nations, a Social Justice Group, an Oxfam Hunger Banquet simulation, and a fundraiser auction for The African Child Initiative in Kenya. We picked roommates, made independent travel plans, and bought our books together. In other words, we collectively shaped our journey long before boarding (or even meeting). Implementation of a similar system would be ideal for OU, ensuring flexibility both before and during travel. The better we plan, the less of a hiccup a connection lapse will be. The capacity to produce physical prototypes is as essential to design practice as connectivity. Thus, in addition to classrooms and offices, the ship will contain dedicated studios and properly equipped workshops. Digital technologies like rapid prototyping go a long way towards enabling mobile production, but a basic set of tools and materials will also be available on board, mimicking the tool sets of the countries we will visit. Additionally, innovative products like Bridge City's powerless table saw may be used to minimize power usage. 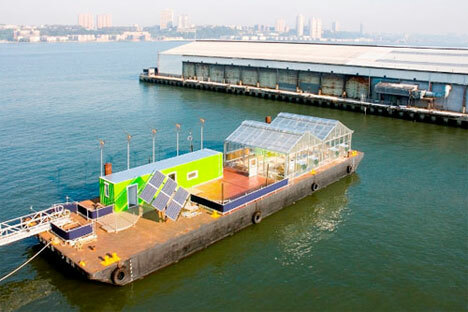 The Science Barge grows food hydroponically off the shore of New York City. Image: NY Sunworks. Special On Board Activities As a neutral and insulated environment, the ship itself presents a special opportunity to rethink our environmental amenities. Because on board resources are necessarily scarce, the vessel is a prime candidate for the testing of new sustainable technologies. For example, we will grow some of our own food with a hydroponic garden (much like NY Sunworks' Science Barge, pictured above), while studying crops that can better withstand salt water. Similarly, the ship's finite supply of potable water and electricity mandates design explorations of their production and usage. Finally, OU is interested in hosting a variety of educational events, including industry conferences, weekend workshops, and traveling exhibitions. Visiting children after a UNICEF vaccination day in Guayaquil, Ecuador. Call to Action: Learning from the World One Port at a Time We cannot be designers and design in the blind: we must go to where the action is. If you had the chance to travel the world, where would you go? What would you do? Ocean University invites you to join a passionate community, reckon the realities of the world around us and beckon the world's greatest challenges. We are Ocean, who will you be? If you are a design school, organization or individual interested in co-creating this community you can follow our progress on twitter, sign up for updates on our website or get in touch with us at info.oceanuni [at] gmail [dot] com. Remember, as humanity, we are all on the same boat. All images cc-by Arturo Pelayo unless otherwise specified. Arturo Pelayo is an Instructional Designer and Social Media Consultant. In addition to spearheading Ocean University, he specializes in helping organizations with their eLearning and workforce training needs. You can find him at MediaAlchemy.org. It sounds very interesting what you guys are planning and already have done! But i have my difficulties stay up to date with that project - as a non twitter user. Is there a way to read the news about OU on a website or get a newsletter? @ Mr. Mancini: Thank you for the nice comment! Greetings to the Cisco Team! @Ms. Poking: We invite a diverse community and subjects will range from Energy, Development, Storytelling, Inter-cultural Communication and beyond. While OU has a Design focus, there are many activities happening aboard: Climate Change research, Biodiversity studies, Aquaponics & beyond. @designobot :: As you mention "design can happen anywhere". We are excited to leverage our mobility and as Dr. Paul Polak says, "go where the action is". It is too late to be a pessimist. Join us. I have no problem with designing on a cruise ship connecting with as many people as possible in many kinds of points. I don't think it matters where the design happens, design can happen anywhere. The ideas are what is important. Wonderful and meaningful design at it's best. I welcome your message and would like to clarify. While it is true that the association between "cruise ship" and glamour or luxury has been well cemented over the past decades, we are not traveling the world in a 'luxury cruise ship'. This expedition sets out to learn from the world one port at a time. There is much innovation that can happen in a contained space as OU will be. Traveling the world on a luxury cruise ship seems like a strange way to connect with bottom 10% of the global population. While I believe that the designers involved will benefit from this experience, I remain unconvinced that this benefit will ever reach the low income communities that OU proposes to serve. As someone who participated on the initial TSS as part of their Global Scholars programme, I can attest to the value of having such an adventure in learning return. Arturo's vision is sound; it is clear; it is worth exploring. As a good friend told me, 'the current crisis is a sea of opportunity.' It is time we took advantage of this opportunity to create an environment in which our future leaders can realise their potential. 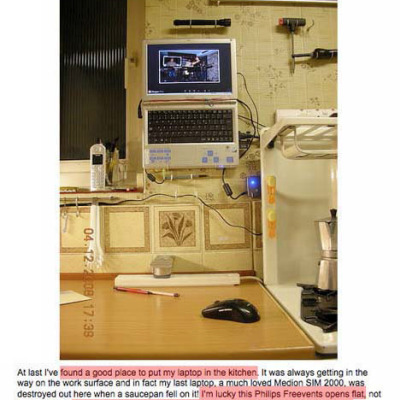 Like Arturo, I was also a student on the maiden voyage of The Scholar Ship (TSS) in the Fall of 2007. It was a truly transformational experience for myself and so many people onboard. It changed and informed our perspectives on our own identities, how we relate to each other, and how to interface with the realities of a rapidly globalizing world. Arturo's vision, as presented in this piece, not only maintains the strongest aspects of the program we both were fortunate enough to experience, but builds upon it in critically important ways. Transforming the sea-faring university setting into a more collaborative, non-profit, design-oriented, research-based, and activist-friendly territory will strengthen what was already a brilliant model for promoting international education, intercultural competency, and global bridges between different peoples and communities. Upon a strong foundation, an incredible structure will be built using this blueprint. Not only should The Scholar Ship program be resurrected, it should be resurrected in the form Arturo envisions here. If you find the possibilities of this potential program to be as remarkable as I do, then please visit the website and get involved in making this dream a reality. Great article. Architecture for Humanity is currently launching a Pac Rim studio connecting 6/8 universities with projects that impact issues around the Pacific Ocean (timed with the Plastiki voyage). Currently Australia, China (Hong Kong), New Zealand and the United States are on board. Would be great to have a floating studio too. 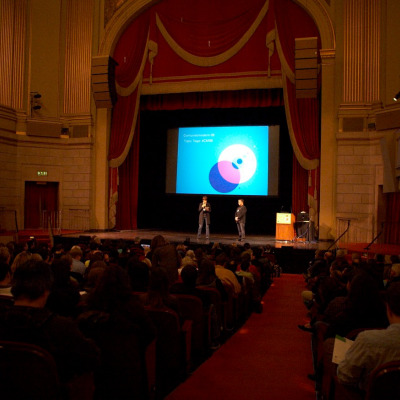 Fast, Cheap & Fantastic: A future strategy for Design?